Blog › Do you live in a gated property, or own gated work premises? An external letterbox can be convenient for postal services when a property has a long driveway or gated parameter to deliver mail. Our Railing and Gate Letterbox is perfect if you own a gated property or gated work premises, as it is suitable for both home and office use. This large fixture is manufactured from gauge steel, with a powder coated durable finish available in selected colours. A Perspex name plate is provided to clearly label your house name or number, to ensure mail is delivered to the correct address. The simple lockable design allows you to retrieve your mail safely and securely from the back of the letterbox with a key. 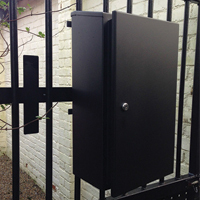 If you would like to find out more about our gate letterbox, or any of our individual or commercial letterbox models available, simply contact us today.